What’s the Real Problem Disney? Home/Blog, Customer Service/What’s the Real Problem Disney? Want to get in the front of the Disney lines? 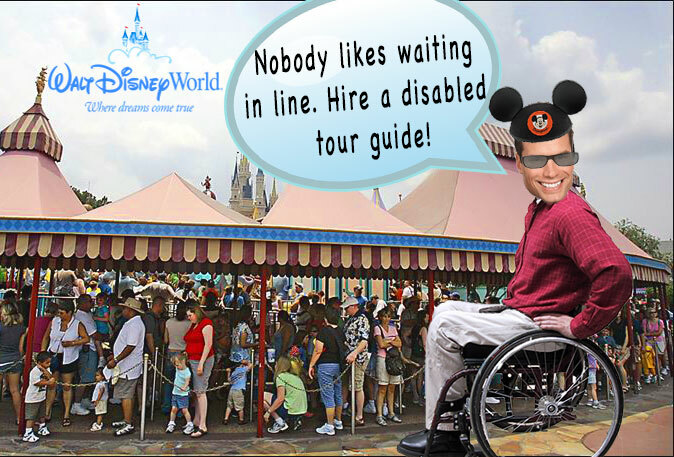 Hire a disabled tour guide. 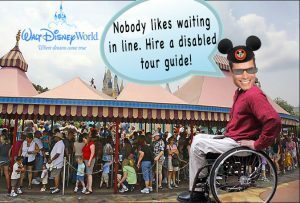 I got quite a laugh when I read that people were buying handicapped stickers so they could cut in the waiting lines at Disney. Are the lines still miles long? The last time I was at Disney the lines to the rides were so long I wanted to cry. Actually, I just wanted to take the crying four-year-old back to the pool. As I recall, Jerrod wasn’t the only one getting, hot and edgy, both the adults were hot and tired. I thought about using the bathroom but knew I would lose my place in line. Disney who is noted for their magical customer service has hit a snag. They are investigating the people selling the handicapped passes and taking people to the front of the line. Apparently the tour guides are going for $130.00 and hour. Yes selling handicap passes to get customers to the front of the line isn’t ethical but I think it’s covering up the real problem–unbearably long lines. The real problem is, why do we have to stand in line for 45 minutes and pretend we like it. I”m sure that many people have complained but Disney hasn’t fixed it. So, the customer has decided to take matters into their own hands–buy bootlegged passes to get in the front of the line. The customer sees a problem so they fix it. Bootleggers see an opportunity, so they create a business. It all goes back to the same problem–the lines are too long. I believe this is called ‘blaming the customer’ for your inadequate customer service. For anyone who has waited in line for a ride you know what I mean. It’s actually easily fixed, provide free ice cream, have clowns, free water, face painting and anything else to keep people from wanting to slap each other. I suppose you could put in more rides but that might not be feasible. In a recent study on customer service out of the UK, it seems the the younger generation that are more willing to tolerate long hold times, perhaps due to a greater capacity for multi-tasking. 49 percent of 16 – 24 year-old are prepared to wait 5 – 10 minutes before hanging up and 30 percent would wait 11 – 20 minutes. Us older folks seem to have a shorter fuse. Maybe it’s because we don’t want to spend our time in lines. Of those aged 55+, only 9 percent would wait 11 – 20 minutes and 22 percent hang up within 5 minutes. According to the results, men are generally more impatient than women, with a fifth prepared to wait less than 5 minutes (20%) versus only 13% of women. Following a great customer experience, women are more vocal at recommending the company – whereas men would actually use the service more frequently. Another study reports that 43 percent of consumers said long lines will affect their decision to shop a particular retailer in the future — and three percent of those consumers will stop visiting the store. It’s obvious, none of us like lines. Many of the supermarkets are very responsive, if they see more than 5 people in a line they bring in another cashier. What about lines in at the airline ticket counters. For those of us who travel often, we know it’s a fact of life, and personally, I don’t really notice anymore. When customers ‘step out of line’ or seem to be causing trouble, it’s likely there’s something wrong with your customer service. Want to know which lines take the most times and where to go to meet your Disney characters? How about an app that tells you what you need to know.For $13.95 a month you can find the real wait time at Disney! The app is called Touring Plans and it is updated during the day with information from customers standing in line! Apparently you can get the information from Disney about the length of the line but the time really depends on how busy the park is. So what to do when your customer acts up? Ask yourself, is it something we need to better or is the customer just crazy? Even nutty customer should be an audience, you never know, you might learn something for your business. Come on Disney, you can do better than this. What’s your experience with Disney, love to hear it. You hit right on, (as always) Lisbeth. Disney must be tossing in his grave! He was THE innovator of customer service and experience of the last century. Every aspect of his parks, down to the tiniest detail, including colors, sounds, and the landscaping were designed to enhance his visitors experience. He had a Utopian view of the future and innovated such things as moving sidewalks, monorails and subterranean service systems Shame his company has lost sight of his original intent. One other solution might be – don’t sell so many tickets on the same day! Here at Disneyland, the longest line is also one of the rides that don’t have a fast pass either, the Matterhorn. So you can wait in line for up to 2 hours. I mean roger rabbits cars has a fast pass! I think you’re right about Walt, his ideas was about having fun and doing whatever it takes to enhance the consumers experience. Businesses get big and forget about customers. In this case they’re the littlest customers. Interesting to hear from Tabby in California that the Matterhorn has a waiting time of two hours. Roger Rabbit must get a kick out of it! I love Disney, and I’m not thrilled about lines. BUT, it seems to me Disney has been innovative in dealing with line area hassles for decades. The “story” or “show” for Disney attractions really begins in the queue area. If the guest is paying attention he or she will be able to hunt for hidden mickeys, point out the story details to kids, and sometimes,enjoy interactive story elements ( the rope pull spot for the Indiana Jones ride at Disneyland). There is at least one cast member in every line area, helping with stroller swap passes so no family is forced to double line because of height restrictions or tot fears, and they often chat and play when the Lines are long. Approaching with honey rather than vinegar is more likely to help. Years,ago, when pin trading began, Cast Members working the lines,began,wearing,trading pins on their lanyards, and will take a few moments,to,trade with hot and tired tiny pin,traders. your kids don’t pin trade? Most CMs also carry stickers, and I remember one decorating my infant sons legs, cheeks and tummy with Mickey stickers while we waited to board a Small World boat. The introduction of the fast pass system, meant guests could choose a popular ride, get a return time, and skip the line….FREE! When other parks copied the system they charged premium prices for the same service, and didn’t limit times. Now Disney is upping the game again with Fastpass Plus. The new system allows guests to arrange Fastpass appointment times from home! Guests with Fastpass times don’t get into the queue, so they aren’t adding to YOUR wait time in the queue, when you didn’t get a Fastpass! Could they do more.? yes. Will Disney keep figuring it out and upping the game? Yes. here is what I really wish: That DMV had Fastpass, that the shmucks who send out Jury Duty forms worked,like the line attendant at Disney handing out stroller passes. And that all hotels had disney cartoons playing within sight range of the check in desk!